The Italians capitulated just as the Allies advanced on mainland Italy following their successful invasion of Sicily, codenamed Operation Husky. Some landings on the mainland were unopposed but in the case of Operation Avalanche, the landings at Salerno, there was strong opposition. This page gives a short account of the actions as far north as Rome. After the fall of Sicily, Mussolini was removed from power as the result of a palace revolution on 25th July 1943 when King Victor Emmauel II publicly announced an armistice with the Allies, ceding the government to Marshal Badoglio. Officially, the Badoglio government continued to support the German cause but it was evident that Italy was on the verge of surrender. Mussolini was imprisoned in an inaccessible hotel in the Gran Sasso. Badoglio opened negotiations with the Allies via captured British General Carton de Wiart. American, British and Italian representatives met in Lisbon which resulted in an armistice being signed at Syracuse on 3rd September. This was the very day the Allies, after the briefest possible lull in their operations, crossed the Straights of Messina from Sicily to Reggio in Calabria to continue their advance on mainland Italy. The Germans had been expecting the defection of their Italian allies and acted promptly. Rome was seized and the King and Badoglio slipped through the German net with the greatest of difficulty. Much of the Italian fleet, including four battleships and six cruisers, sailed to Malta and surrendered in early September. With the Italians out of the war, the British landings at Reggio on the 3rd September and the seizure of Taranto on the 9th, were not contested. 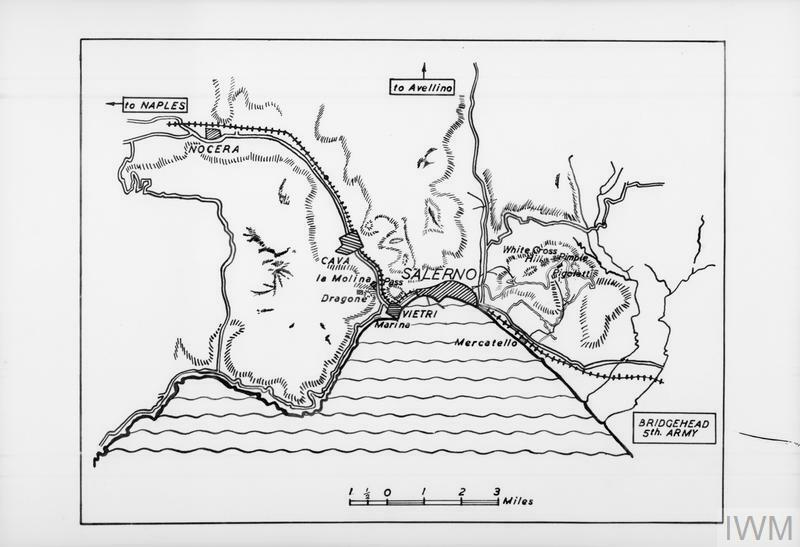 However, the situation was different in the Gulf of Salerno, south of Naples, where the US Fifth Army landed on the 9th. A landing further north was considered too risky because of enemy fighter cover. Furtherore, an American plan to land an airborne division at Rome was abandoned. Five German divisions were concentrated against the Salerno beachhead and after a few days of fighting, it seemed possible that the Allied forces would be pushed back to the landing beaches and compelled to re-embark. The Luftwaffe scored hits with glider bombs on the British battleship Warspite and two American cruisers. But the Allies had massive air support and by the 15th, the Germans began to yield. On the 16th, the advance guard of the Eighth Army, which had covered some 200 miles in the 13 days since their landing at Reggio, made contact with the Fifth Army about forty miles south-east of Salerno. The Eighth Army now shifted the axis of its advance to the east coast. 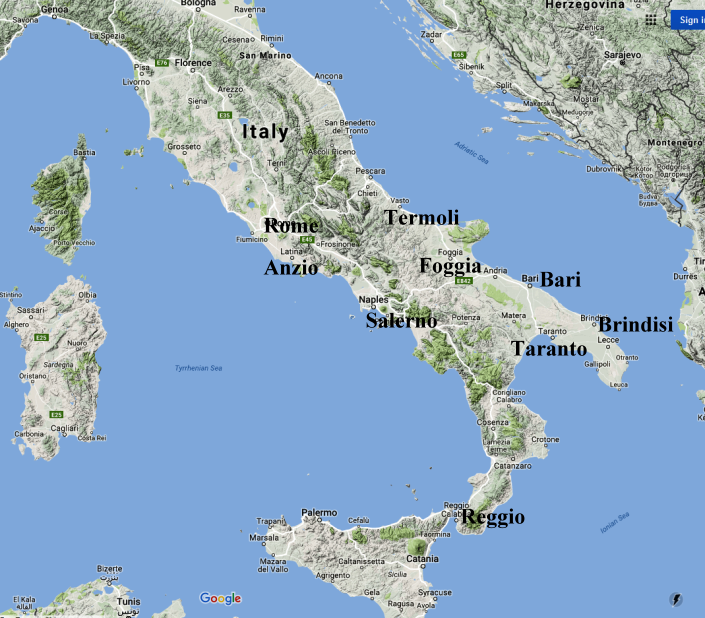 Using Brindisi and Taranto as bases, they pushed up the coast to Bari, which fell on the 22nd. Foggia, with its complex of airfields, fell on the 27th. Not until Montgomery reached the river Biferno did he encounter serious opposition. 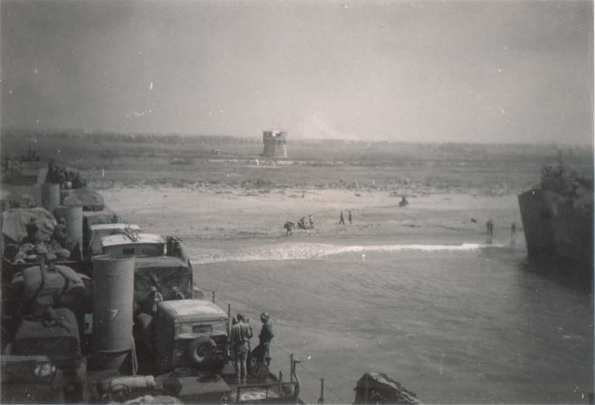 A commando landing seized Termoli which was subsequently held by 78 Division against the 16th Panzers' counter-attack. The campaign now became a fight for the river lines. Montgomery's methodical approach to these obstacles was not without criticism. General Fuller described Montgomery's approach as follows;. 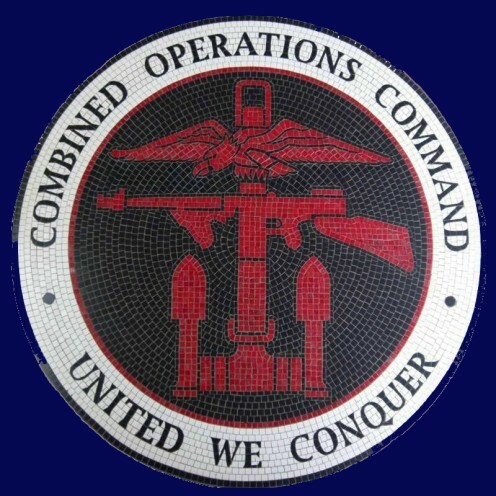 "These tactics consisted in: (1) the building-up of such a superiority in every arm that defeat would become virtually impossible; (2) the amassing of enormous quantities of munitions and supplies; (3) a preliminary air and artillery bombardment of obliteration; (4) followed by a methodical infantry advance, normally begun under cover of darkness and (5) followed by tanks, used as self-propelled artillery, to provide the infantry with fire support." However, the Germans fell back to Trigno and then Sangro under this irresistible advance. They fought relentlessly but eventually their resistance broke. On the west coast the pattern was similar. Naples fell on 1st November, causing Kesselring to withdraw to Volturno and then, under continued Americans pressure, to the River Garigliano. On the 24th of December, preparations for Operation Overlord (the Normandy landings) made significant changes to the high command of Allied forces in the Mediterranean. Generals Eisenhower, Montgomery and Bradley, together with Air Chief Marshal Tedder, returned to England to take up new appointments. General Sir Henry Maitland-Wilson succeeded Eisenhower as theatre commander and Lieutenant-General Sir Oliver Leese took over the Eighth Army. Several Allied formations were withdrawn from the Mediterranean theatre to form the core of the invasion force for Normandy. This left General Alexander with the Eighth Army, comprising seven 'British Commonwealth' divisions and the Fifth Army under General Mark Clark, which contained five American, five British and two French Divisions with a Polish division in reserve - a total of 20 divisions. To oppose the Allies, Kesselring had 18 Divisions - 5 were holding down northern Italy, 3 were in reserve and only 10 were actually in the line. The Battle of Garigliano began on the night of the 17/18 January but the Allies made very little progress. 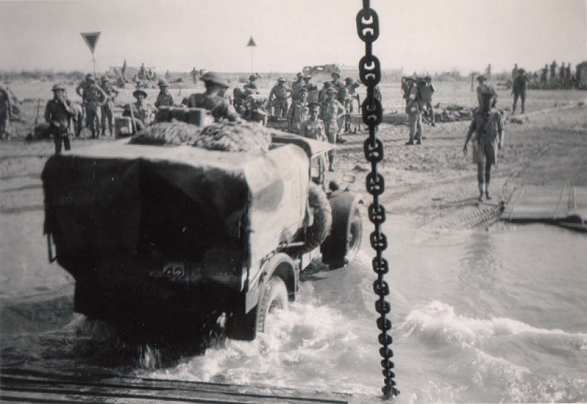 On the 2nd of February General Mark Clark, with 50,000 British and American troops (VI Corps, Lucas commanding), landed at Anzio. 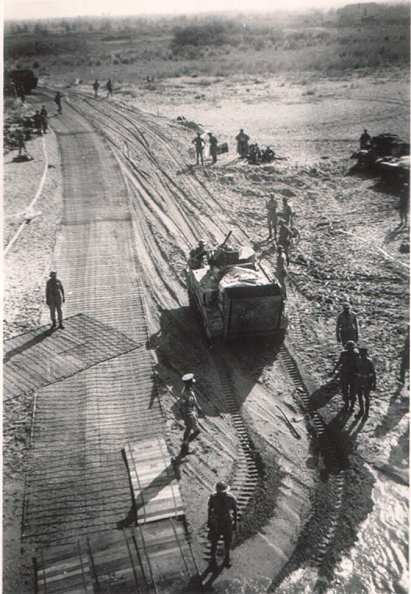 Instead of pushing inland and cutting the Germans supply lines to Garigliano, Clark dug-in to consolidate his beachhead, while the German forces set about his containment. This cautious conduct of the landing seriously impeded the Allied advance. It was a lost opportunity to inflict serious damage to the German rear but it was a lesson brought home to the planners of Overlord. A similar situation would not be allowed to develop on the beaches of Normandy. Along the River Garigliano, the Germans stood fast with their hold on the great fortress of Cassino unshaken. On 29th January, the Allies launched another attack on this little town but, by the 4th of February, it ended in failure. The Abbey of St Benedict, high above the area of conflict, was well placed to observe the whole battlefield. The Allies decided to remove the threat and on the 14th February they dropped leaflets on the abbey warning that it would be obliterated the following day. On the 15th, 254 bombers dropped 576 tons of bombs and turned the Abbey into a heap of rubble. However, the Germans had constructed bunkers and strong-points in the abbey, which survived the bombardment and were actually strengthened by the rubble. After another day's bombing, the Allies launched a fresh attack on the 18th February following a five hour bombardment. However, this failed to resolve the problem of Cassino and the infantry was soon held up. Conditions began to resemble those of the Somme in the First World War. General Alexander, a veteran of the first world war, quickly called off the attack. On the 15th of March another attempt was made, this time in excellent weather. The preliminary bombing of 1,400 tons lacked accuracy. Allied positions were bombed up to twelve miles out from the target. There followed a two hour attack by 900 guns, then tanks and infantry went in. Water-filled craters fouled up the tanks which should have supported the Infantry. After nightfall, this offensive was also halted. Another offensive was launched on the 11th May. This time, Cassino was outflanked and despite heavy losses, the Polish Corps fought its way through to the north of the town and fell on it from the rear. Cassino fell on the 17th. The Poles took Monastery Hill on the 18th. 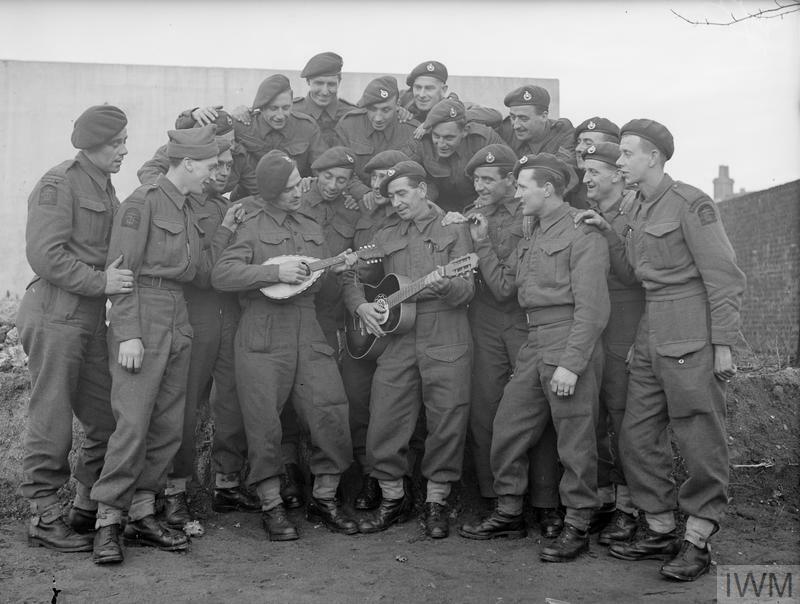 Left to Right; 1) Salerno 9th Sept 1943. (D-Day). 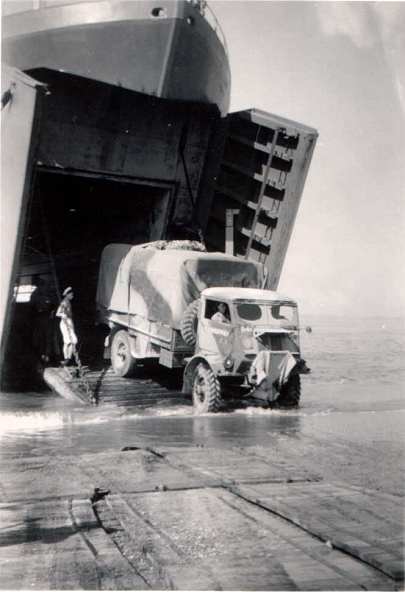 427 disembarking mechanised transports. 2) 'Roger Amber' beach viewed from the bows of 427. 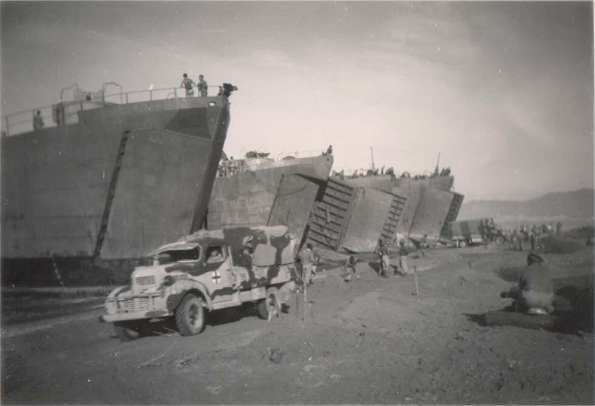 3) LST unloading mechanised transports. 4) LSTs beached. Centre of the view is a Martello Tower. 5) LSTs beached. Pennant numbers unknown. Chronological summary of the whole of the Italian Campaign. Click here. This brief account of Operation Avalanche, the landings at Salerno and subsequent actions in Italy is based on an article by James Paul.